If you choose to become part of the First Hotels family you will gain access to a strong network with more than 2000 unique hotel co-members in Scandinavia, Iceland and Spain. Through our global partnerships, we will make your hotel visible to guests worldwide. You will also gain access to attractive prices for equipment for your hotel through our agreement with the purchasing organisation Nores. Our distribution and revenue team helps and supports you with your revenue undertaking. Our main focus is to generate increased room revenues through First Hotels’ own channels as well as through external booking channels. We strive to gain an overview of prices and to assist with communicating your prices to carefully selected markets and partners. We help to manage projects and will assist you with the development and implementation of technical solutions. We also support your hotel with training and technical support. All with one goal in mind – to generate more bookings and increase the room rate at your hotel! Sales and marketing is key to increasing your hotel revenue. We work hard to strengthen our brand and increase the visibility of your hotel through our many channels of communication. We believe that maintaining a good and close partnership is key to achieving beneficial results. We therefore offer you close follow-up via direct communication, regular meetings and our annual conference. Additionally, we are, of course, always available for help and advice along the way. Our sales organisation strives to provide your hotel with profitability through local, national, Scandinavian and international accommodation, and conference agreements. Our sales team at our head office in Oslo and in our offices in Stockholm and Copenhagen endeavour to make your hotel accessible and visible on the global map. We work with companies and travel agents and offer a large customer base with corporate agreements that generate sales and traffic to your hotel both in terms of conference and accommodation bookings. The leisure segment is also a target group that we work with to generate traffic and volume at your hotel. We always work closely with our member hotels. We believe that a good partnership is essential to achieving increased sales and revenue. We hold regular meetings and host regional activities and offer tools and training. We continuously strive to market the First Hotels brand as well as all our hotels. We work to raise awareness of First Hotels because strong brands increase repeat business, sales and profitability. We work with communication, dialogue and sales through channels such as website, newsletters, CRM and social media to strengthen customer loyalty and boost the reputation and awareness of your hotel. Naturally, we also work with sales activities as well as advertising campaigns and concepts to attract new segments of customers and guests. All our member hotels have access to professional marketing tools, incl. websites and portals. We offer assistance with the production and design of printed material for the media bank and for handouts to name but a few of our services. We are committed to promoting and selling the hotels in the chain – to generate revenues for your hotel! We assist you with financing and procurement. We ensure that all distribution costs, commissions and revenues are to the benefit of your hotel and are debited and credited on time. As a member, you also gain access to our beneficial procurement agreements with reasonable prices for the hotel’s procurement, so you can use your time as efficiently as possible and focus on the overall operation of the hotel. Our loyalty program offers benefits and bonus points (FirstCoins) to members when they stay at our First Hotels in Scandinavia and in Iceland. Membership is free and members receive benefits and earn FirstCoins from their first night of stay. All new members also receive 50 FirstCoins (= 50 NOK) as a welcome bonus. First Member offers four different membership tiers: Silver (welcome level), Gold (after staying 3 nights), Platinum (after 15 nights) and Black (after 30 nights). The membership tier is based on the number of nights the member stays with us over three full years. The higher the membership tier, the better benefits the member will enjoy. Our members always receive offers and information before anyone else. 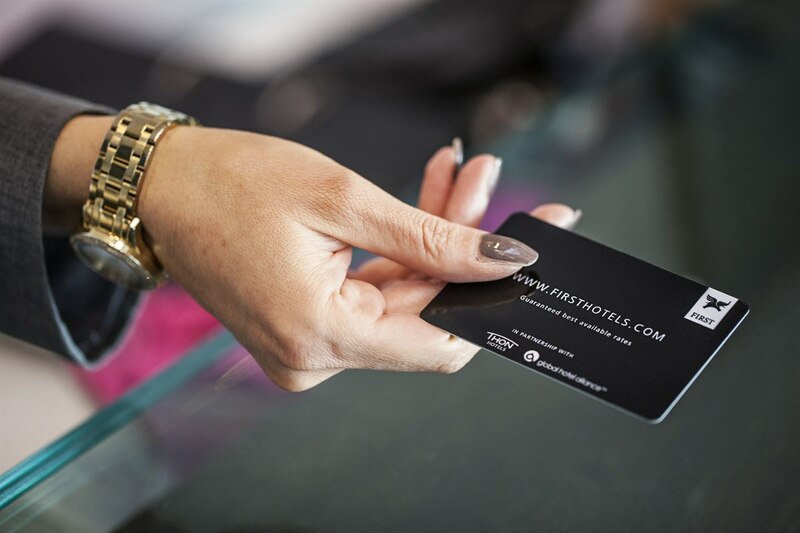 Through our loyalty programme, we help you gain new customers for your hotel. Read more about the programme here. Naturally, we offer a good training program for both you and your employees so that you gain a good start and enjoy all the benefits of being part of the First Hotels chain. Introduction days, physical workshops, online courses and meetings are all part of our regular training offerings. We also have an extensive toolbox, which you can access and will be given instructions in how to use. In addition, we provide you with tailored training if required. Our goal is that you get to know us and we get to know you – so that we can maximise profitability for you and your hotel!